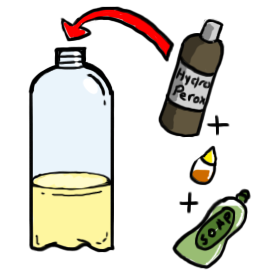 In this activity, you will be observing a chemical decomposition of hydrogen peroxide. Before starting, you will need the help of your parents to gather materials. 1. Add hydrogen peroxide, dish soap, and several drops of food coloring to the bottle and swirl lightly to mix. Be careful not to shake the bottle too hard and create lots of soapy suds. 2. Mix water and yeast together in a separate dish. 3. 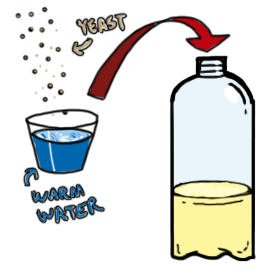 Pour water-yeast mixture into the bottle. Do this quickly because the chemical reaction will begin immediately. 4. Make a note of your observation! You just witnessed the decomposition of hydrogen peroxide! Hydrogen peroxide (H2O2) is constantly decomposing into water (H2O) and oxygen gas (O2). The reason you don’t normally notice is because the process is typically very slow. The reaction you just did happened very quickly because the yeast acts as a catalyst to the reaction. In other words, the yeast helps the hydrogen peroxide decompose into more stable compounds. The reason you see the reaction so clearly is because we added dish soap. 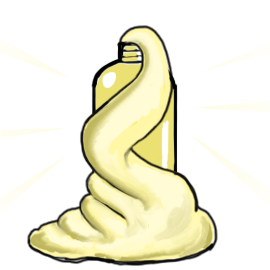 The oxygen gas that is given off by the reaction gets trapped in the soap and creates foamy suds that bubble out of the bottle and look like toothpaste big enough for a giant elephant! Hypothesize! Ask yourself the following questions and write down what you think will happen in each scenario. 1. What would you see if we left out the dish soap? 2. What would happen if you use more hydrogen peroxide? 3. What happens if you use more yeast? Design Your Experiment! Do the activity a few more times changing one variable at a time. For extra accuracy in your experiment, do several trials! Make Observations! Make note of what you see during each of the trials. Draw Conclusions! What can you tell from the observations you noted? How did changing each variable affect what you saw? Was your hypothesis correct?